Any chance of updating the User Interface related to repair time? Well, the idea is that you can see for each Booster separately the expiration time. Combining that wouldn't really work I think. I guess the box could automatically expand to the window boarder, this could work on higher-rez monitors only however. Not sure if this is a problem many players encounter however. Combining all same types that expire at the same time is a partial solution, the ability to expand or resize the box ourselves is another. I wouldn't know about smaller than 1920x1080 as the game barely fits on HD screens, I use HD and WXHD (3k). Hi, I am a little confused about offense repair time. I am on wrath 23 and this is my first world in a couple of years. 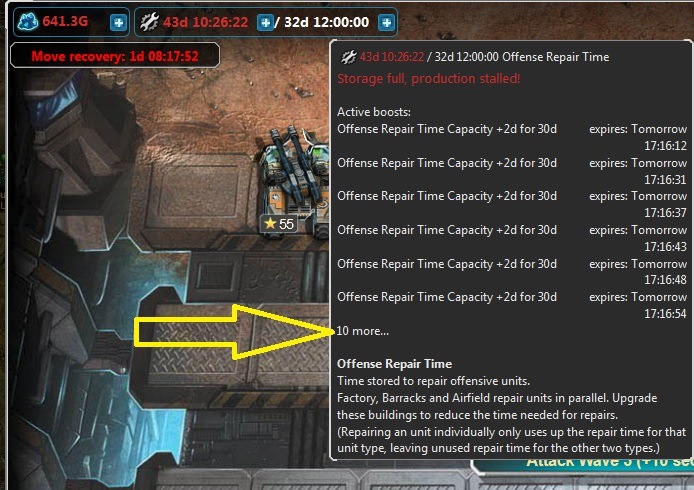 I am used to see offense repair time appear in my resources and when needed I click on a offense repair (after I purchased them) and I repair my forces. Now on my 1st world in years I don't see offense repair in my resources, but now they appear as a item(s) I purchased and expiration date as the screen above shows. This is confusing. When we receive complementry offense repair time from you guys we get a item in our resources which we can use just by clicking on them. This morning when I signed on and attacked fb I turned yellow after 2 attacks and I have over a dozen offense repair packages as shown above (none in my resources screen) and my cy is above my base level and my airbase was above my planes (attack was GDI planes). I don't think the offense repair time (ORT) time is working right for me. Now if I am wrong, I would like to see a detailed explanation how your ort works. This is crazy that we spend funds for ort that doesn't appear to be working. Now I understand we can't have unlimited ort to attack endlessly, but the time it takes to accumulate rp's limits any expenditure of resources purchases. Please take a look at my bases on wrath 23 and tell me if I screwed up somewhere or explain to me why we spend so much purchasing ort and we receive so little in return. Your memory is in error. 2yrs ago you could not purchase Offense repair time as a crate to go in resources, only as an increase in capacity. They introduced the ORT crates after a particularly bad period of downtime and were only available as a gift from them. More recently they have added them in the Premium packs as well as still including them in the gifts after poor server performance or other issues. I don't quite follow your explanation of what is happening - when you attack a base you have injured or damage units. Each type of unit requires the appropriate resource building such as barracks for infantry, factory for ground vehicles and airbase for aircraft. The amount of repair time is calculated for each type of unit and your overall repair time needed is the maximum of the 3 types. This is then deducted from the available repair time. You will see two figures, such as 2d 12h for the capacity (on the right in white) and the amount accumulated overall over time. This will stop increasing when you reach your maximum capacity. If you are at maximum (at the start of a session, more than likely) the total available and the capacity will be equal and shown in red. As you consume repair time it will change from red to yellow indicating you're close to capacity and if you consume more then it will turn white. You haven't included an image so I can't see the detail of what you're referring to. Image showing repair time total in yellow as it is close to the maximum of 2d12h. The white cross on the red background next to the yellow writing indicates I have some of the repair time crates in my resources area.